Noli, First Floor Apartment With Garden! Property 11: Noli, First Floor Apartment With Garden! Calice Ligure: Rural House of 1700 immersed in the greenery of nature. Property 17: Calice Ligure: Rural House of 1700 immersed in the greenery of nature. 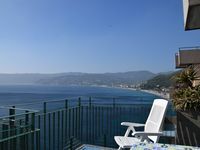 Property 26: Beautiful and new apartment near the beach of Finale L.
Property 29: Spacious, Airy Apartment in Sunny San Bernardino, Finale Ligure. island apartment. 2km from the sea and 10 minutes from the center. Semi-detached house. Property 33: island apartment. 2km from the sea and 10 minutes from the center. Semi-detached house. Ca' de Alice - Mare, verde e relax in Noli! Property 38: Ca' de Alice - Mare, verde e relax in Noli! Property 43: Your house and garden in Noli: sea and history! Amazing views, clean spacious well equipped apartment, suit family with 2 children (2 bedrooms). Bergeggi close to beaches and other tourist opportunities. Friendly host and easy to deal with. We loved the apartment which contains everything necessary for a holiday and features pieces of antique furniture. The apartment shows much nicer than on the photographs. Communications with the owner Fiammetta were easy and she always answered our questions promptly. The only downside was a proximity of a fairly noisy road which separates the first line of houses and the beach and lack of free parking spaces in vicinity - even in September we had to hunt for a free spot after every car trip. However, this is very common for Noli which is squeezed between two hills. The town itself is very nice and has plenty of options for eating out and a few groceries. Bigger supermarkets are within 10-15 min by car.